Below are compared precipitation and the 2yr/2yr Berg Timer since 1895 with forecast through 2026. High BT = High Precip. The major bottoms of BT correctly forecasted drought for the middle to late 1930's, mid-50's, mid-70's, late 80's and early 2000's. This BT/Precipitation correlation was published before 1988 and is, to my knowledge, the only indicator to have correctly forecasted the 2001/2002 drought. Forecast published Feb 2010: Our last drought ended in 2002 as forecasted. Precipitation increased in 2003 and peaked in 2004/2005 as forecasted. Then a decline into 2007 (which we got). The years 2014-2015 will be very dry, probably drought years. Tell your children and grandchildren to expect strong droughts in 2029-2030 because precipitation will peak in 2022 and then make a long steady decline until 2030. But then precipitation only makes a partial recovery to 2034 before again declining and causing another drought in 2035-2036. Could be very hard times in the late 2020's to mid-2030's if we're not prepared. Below are compared temperature and inverted yearly Berg Timer since 1920 with forecast to 2030. High BT = Low Temperature. Since BT correlates positively with precipitation it's logical that it would be negative for temperature since it's usually cooler with high precipitation. Notice the general trend up from the early 80's when BT was very volatile and at its highest. That major low is what was shown in the very long-term temperature correlation chart on the home page. Notice the smaller volatile period coming up in the 2020's when a drought is expected. Want to know when it will be REALLY hot in Miami? Below are compared daily mean temperature in Miami and the Berg Timer. High BT = High Temperature. Low BT = Low Temperature. The Great Mississippi Flood of 1927 was the most destructive river flood in the history of the United States. The flood unleashed a spring season of catastrophic events along the banks of the Mississippi River. The flood affected Arkansas, Illinois, Kentucky, Louisiana, Mississippi, Missouri, Tennessee, Texas, Oklahoma and Kansas. Arkansas was hardest hit, with 14% of its territory covered by floodwaters. By May 1927, the Mississippi River below Memphis, Tennessee, reached a width of 60 miles (97 km). Political effect of the flood --- The Republicans had strong backing from African Americans in 1927, ever since the times of Republican President Lincoln. However, when Republican President Herbert Hoover failed to carry out his promises to provide levee-building funds to the south after the flood, African Americans moved in droves to support Democrats, which has been sustained to this day. Thus, the effects of the Berg Timer and weather upon history. Since Daily BT can forecast precipitation, it's not surprising that BT can also forecast automobile accident rates. Below are compared total daily auto accidents in Oklahoma and daily Berg Timer for the first half of 2000. 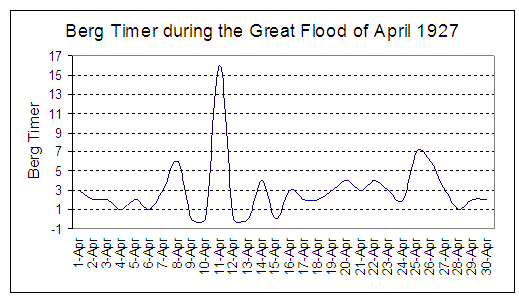 Below that is a chart of Daily Tulsa Oklahoma Precipitation for the same period. BT has been shifted five days to the right to account for the five day lag period for Oklahoma. Almost every peak in accidents coincides with a bottom in BT (BT has been inverted for easy viewing). Law enforcement and health agencies all over the world can use this to prepare for probable high accident periods. Below are compared New York City humidity and Berg Timer for the last half of 2005. When BT is high humidity is high. You can greatly reduce chances of precipitation and high humidity by scheduling your outside activities when BT is low. Great for planning grand openings, athletic events, concerts, camping, etc. A major storm occurred 9 out of 10 times immediately after a BT value of "7" or higher. The Berg Timer accurately forecasted the first major winter storm for early December 2006. Below is U.S. precipitation data compared to the Berg Timer for Fall-Winter 2007. See how the major storms occur around the strong Berg Timer days, especially just after strong BT days. source: weatherunderground.com The combined daily precipitation totals of 30 geographically representative cities throughout the United States. Below are compared Total Arctic Ice (departure from monthly means, Northern Hemisphere, million sq. k.) and The Berg Timer (shift delay of one month for more precise fit) from 1978 to 2002. Major peaks and bottoms of BT and Arctic Ice correlate well. The previous Temperature correlations show that High BT = Low Temperature. So this correlation, High BT = More Ice, is consistent with the temperature analysis. Total Arctic Ice chart source: http://nsidc.org/sotc/sea_ice.html. Below are compared lightning strikes causing damage and deaths in the United States and The Berg Timer for 2003. When BT is low, hitting "0", lightning is most likely, especially if the low BT occurs just before or after strong BT. From May 1 to September 15, 2003, there were 35 deaths, 203 injuries and $23.5 million in property damage caused by lightning. Below are compared wildfires in the United States and The Berg Timer for 2003. This is the same time frame as the above lightning chart. Lightning causes most all wildfires. So, like lightning, when BT is low wildfires are most likely. From May 1 to September 15, 2003, there were 2 deaths, 54 injuries and $85 million in property damage caused by wildfires. Below are compared Hail Storms (hail 3 inches in diameter or larger) causing damage in the United States in 2003 and The Berg Timer. Severe Hail Storms are most probable when BT is low (peaks in the above chart) especially just before and after strong BT. These storms caused 6 injuries, $26 million in property damage and $6 million in crop damage. You'll find on the Natural Disasters page that tornadoes also are more probable when BT is low. Below are wind speed in the United States and Berg Timer for 2015. Strong winds are most likely in the low BT periods just before and after high BT, as is the case with most all indices related to BT. The Viking I and II spacecraft gathered weather data from Mars. Below are compared daily wind speed on Mars, wind speed at Grand Island Nebraska (blue line), and the daily Berg Timer for 1 January through 20 July 1977. Notice how the wind speeds of Mars and Nebraska share exact peaks and bottoms. This is because the timing of weather systems on both planets are caused by the same thing! We will continue to see this correlation with other planets which have an atmosphere. I hypothesize that the fluctuations in solar wind, predictable using The Berg Timer, cause the same timing of weather systems on all planetary bodies in the solar system that have an atmosphere. I have shown how Moonquakes share the same timing as Earthquakes, thus we can extend this hypothesis to assert that all planetary bodies share similar timing of both weather and seismic activity due to a common cause, that cause being planetary position as represented by the Berg Timer. Below are monthly cloudiness in the United States Midwest and Europe, and monthly wind speed in the U.S. Midwest and South America compared to the 7-month and 2-month/2-month moving averages of the monthly Berg Timer. The U.S. cloudiness and wind speed indices cover the area 33.75 to 46.25 N latitude by 93.75 to 106.25 W longitude, an area covering the central U.S.. The Europe cloudiness covers the area 38.75N to 58.75N by 36.25E to 11.25W, which is the entire European continent. The South America wind speed area is 10S to 40S by 60W to 80W. Both the U.S. and Europe share the same negative correlation to cloudiness. High BT = Low Cloudiness. This makes sense considering the Precipitation correlation of High BT = Low Precipitation. I've researched the cloud data for all world-wide locations and have found that there are two specific, broad connected areas which respond differently, one positively and the other negatively to The Berg Timer. The positive correlations between cloudiness and BT cover an area from Canada westward through Asia, then down through India, covering all of Africa except South Africa. Then it continues down through the Indian Ocean to Australia and Antarctica. The negative correlations between cloudiness and BT cover an area starting in the Middle East going west through Europe, then covering the entire Atlantic Ocean area including the Arctic. Then continuing west through the continental United States and into the Mid and South Pacific. Basically speaking, the positive correlations between cloudiness and BT cover an area in a "U" shape from Canada down through the America's (except U.S.) to Antarctica, then up through Australia, Africa and Asia. The negative areas cover mostly the Atlantic Ocean area except Antarctica and the Mid to South Pacific. The land areas which are in the negative areas are the Philippines/Indonesia, U.S., Europe to the Middle East and South Africa. I studied wind speed from these areas and found that when cloudiness is high, wind speed is high, and when cloudiness is low, wind speed is low. This relationship is consistent for both the positively and negatively correlated areas. For instance, the chart above shows wind speed for the U.S. Midwest (a negatively correlated location with respect to BT) with its cloudiness. Wind speed follows cloudiness. Also shown is wind speed for South America, a positively correlated location. Note how wind speed for South America (a positive location) is opposite to the other indices. You'll find below all the locations and their particular response to BT (positive or negative). Wind speed and cloudiness will both move together in their respective locations, some locations moving the same, or positively with respect to BT and the others moving negatively, or opposite to BT. Wind speed and cloudiness correlate positively because they are both effects shared by a moving weather front. As a front comes through, cloudiness is created by the rising warm air and the differences in pressure areas causes the increased wind.